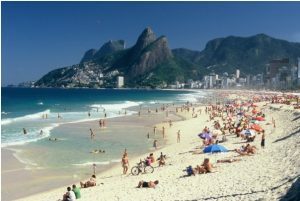 Rio is unique among world cities in the opportunities for spectacular beach running. 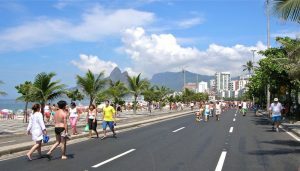 It is possible to run some 20 miles along beach side promenades from Flamengo Beach to Barra, with a few road connections. 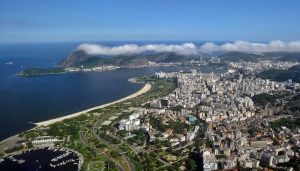 We’ve broken our Rio beach runs into four distinct running opportunities: Flamengo, Copacabana to Leme, Ipanema to Leblon, and Barra. Most of the running is on dedicated boardwalks and multi-use paths. It’s also possible to run on the beach, depending on tides, crowds, and surface conditions. If running on the beach, take extra precaution. es. Once you reach the Monument to Estacio de Sa, you should turn around. In order to vary your return route, take a right (towards the sea) to the Calçadão da Praia do Flamengo. 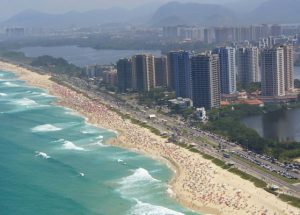 Flamengo beach is near the Rio airport and there are many hotel options in the area. e other. The route can be joined at any point depending on where you are staying. There is a dedicated, paved path that 2.5 miles one way. On Sundays, the road that runs along Copacabana and Ipanama Beach is closed to make more room recreation. hitecture and lots of space. If you’re looking to run a long distance, this route is your best option. Almost 12 miles long, this path offers runners views of the ocean on one side and views of lagoons and the mountains on the other.